AMD Radeon R9 295X2 Dual Hawaii Specs and Pictures Revealed - What a Long Graphics Card! Finally, the much anticipated Dual Hawaii graphics card – the AMD Radeon R9 295X2 was recently revealed thanks to a Chinese community site Chiphell. 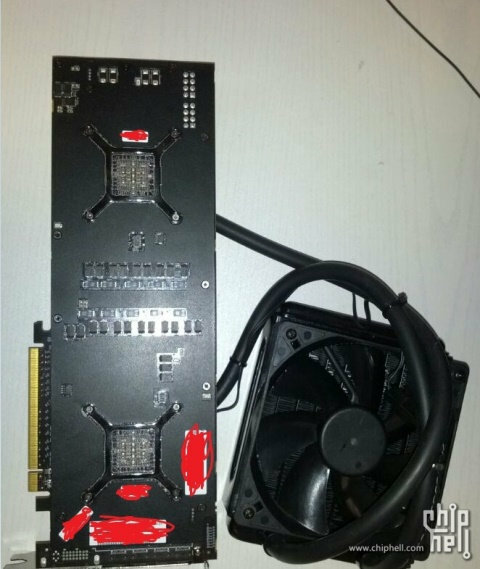 Most probably reviewers already got the steel briefcase which enclosed the R9 295X2, that’s why we are now seeing pictures of the actual card itself. 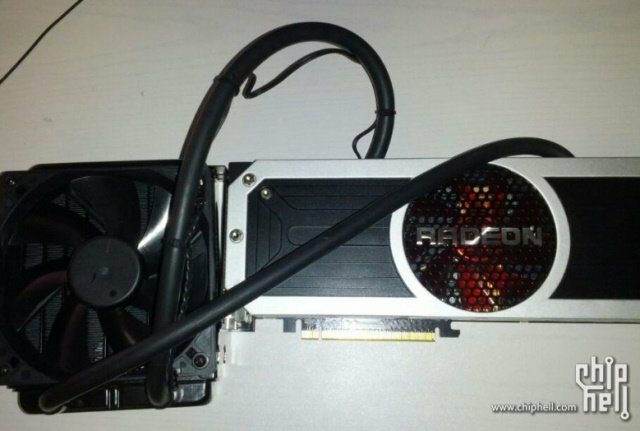 The AMD Radeon R9 295X2 Dual Hawaii graphics card, codenamed “Vesuvius”, sports an air + hybrid water cooler to cool this long graphics card. There are two GPU water blocks, to cool the two 28nm 250W Hawaii GPUs, which are connected to a 120mm radiator. The 90mm fan located on the middle of the card cools the heatsink that absorbs heat from the memory, VRM and other components of the card. The official specifications of the Radeon R9 295X2 or Vesuvius aren’t out yet. But reports claim that the two 28nm Hawaii chips are connected using a PLX PEX8747 PCIe bridge chip. Each GPU features 2816 stream processors, for a total of 5632 stream processors, and it also has a total of 128 ROPs, 352 TMUs and either an 8GB or 16GB GDDR5 memory running on a 512-bit memory interface. There is no information yet regarding its actual operating temperatures or power consumption, but the Radeon R9 295X2 is said to draw its power from two 8pin power connector, and is said to have a TDP of around 375W. It will also consume two PCI slots, with four DisplayPorts and one DVI port. Surely the Vesuvius is capable of connecting up to 5 displays or do gaming at 4K Eyefinity resolutions. But it is unclear whether it is capable of doing Crossfire configuration at this point. Perhaps it can since most high end graphics cards are scalable. The AMD Radeon R9 295X2 Vesuvius doesn’t have a fancy design, but it does have a backplate for additional cooling and to support its long PCB. It is also said that it will be sold in a metallic briefcase packaging. Although this is not official yet, the Vesuvius is said to be price at $1,499. That is half the price of NVIDIA’s GeForce GTX Titan Z. Currently, we don’t know how fast or how well the R9 295X2 performs. But even if the GTX Titan Z would perform better than the Vesuvius, the Titan Z might still lose to Vesuvius since it has a much attractive price point. When that happens, NVIDIA might reveal the GTX 790 soon. Anyway, expect reviews to come out soon. Hopefully we will have a detailed comparison between the Radeon R9 295X2 vs GeForce GTX Titan Z. What are your thoughts about the recently revealed R9 295X2 Dual Hawaii card? We love to hear from you, just hit the comments section below.